As a member of the Glennhawk Family Wine Club, you'll receive 2 bottles of our hand-crafted wines four times a year. Your first shipment will include a bottle of Diablo Royale and Zinfandel. We invite you to join our wine family and experience the personal side of winemaking. We truly value your loyalty and support! 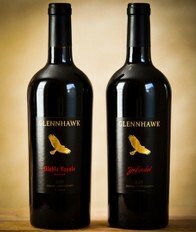 Four times per year, receive 2 bottles of Glennhawk wines delivered to your doorstep. Receive exclusive Club wines and first priority on library wines, special bottlings, and other hard-to-find selections. Invitations to special events such as our Harvest party as guests of the Glennhawk Family. Wine Club members receive a 10% dicount on all orders.